Echelon FrontJocko Willink, a retired US Navy SEAL commander. 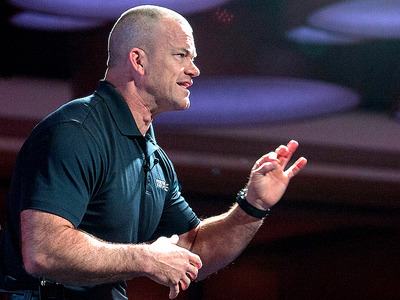 Jocko Willink is a retired US Navy SEAL commander whose latest book is a “field manual” for instilling discipline in your life. He says doughnuts are the No. 1 food he avoids because they lack nutritional value – but they’re ubiquitous in offices. He recommended making a habit of avoiding free food in your office. It’s Friday, and your team had a great week. Your coworker brings in a box of a dozen doughnuts – glazed, chocolate, jelly, Boston cream. In an interview about the book – a collection of insights from his time in the SEALs and at his leadership consulting firm, Echelon Front – Willink told Business Insider why he thinks it’s important to bring discipline to your diet. While doughnuts come in plenty of varieties, the base of fried dough is high in fat, about half of which is saturated. High amounts of saturated fat have been linked to heart disease, and one doughnut can account for about a third of the recommended daily intake. Doughnuts are one of the ubiquitous office foods that you probably shouldn’t be eating, at least not regularly, and it’s why Willink has made it a rule for himself to never accept free snacks. “So what do you do in those situations?” he said. “It’s really easy: don’t eat. Don’t eat the doughnuts. Don’t eat the bagels. Don’t eat the slab of pizza. Either get something healthy or ignore the desire to consume a lump of fat and carbohydrates that will spike your blood sugar, he said. Skipping that doughnut will not kill you.